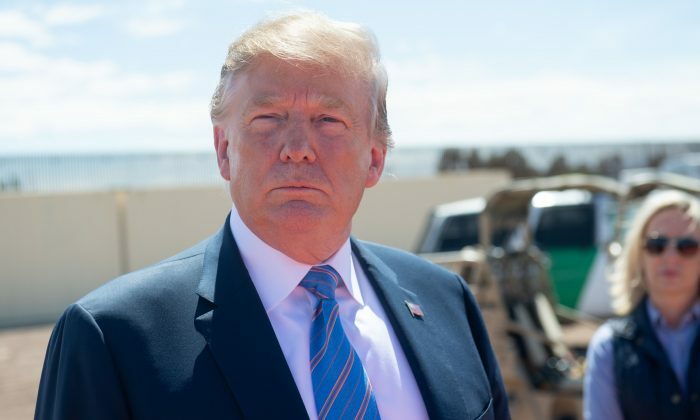 WASHINGTON—President Donald Trump said he was considering financial penalties on Mexico for the drugs that come into the United States through the border, a common route for drugs manufactured in China. “I’m looking at an economic penalty for all of the drugs that are coming in through the southern border and killing our people,” he told reporters in Washington on his way to see the border on April 5. He also said he was considering putting a 25 percent tariff on vehicles from Mexico if the country didn’t do more to stem the mass migration from Central America. Although the United States-Mexico-Canada Agreement, better known as USMCA, would, if passed by Congress, prohibit tariffs on cars, Trump said that these tariffs would supersede the USMCA. In February, Customs and Border Protection (CBP) recorded over 76,100 people who attempted to cross the southwest border at and between ports of entry in February. That’s compared to 36,751 in February of 2018 and 23,557 in February of 2017. As of March 5, CBP saw a 300 percent increase in family units, which have an easier time being released into the United States because of laws preventing children from being deported or turned away at the border. The majority of the migrants are from the Central American countries of Guatemala, Honduras, and El Salvador, which means they mostly travel through Mexico to get to the United States. A week earlier, Trump said he was considering shutting down the U.S.-Mexico border to deal with the influx, a move he has contemplated in the past. Now he says he prefers to try tariffs first, but hasn’t ruled out shutting down the border if need be. The Department of Homeland Security (DHS) said Mexico has been apprehending as many as 1,000 migrants a day and removing 700 of them, which is double the levels of just a week ago. Trump said he was pleased with the steps Mexico has been taking to stop the flow. Later in the day, Trump attended a roundtable with law enforcement on the border in Calexico, part of California’s El Centro border sector, then toured a 30-foot tall, 2.25 mile-long steel-slat barrier that was finished last October. The 70-mile sector has 58 miles of border barrier, but is badly in need of more, and what they have needs updating, Gloria Chavez, the chief patrol agent of the El Centro Sector, told Trump. The new barrier, however, has helped already. Since it was erected, illegal entries have gone down by 75 percent, arrests by 86 percent, and use of force by 65 percent, she said. Across the entire U.S.-Mexico border, 82 miles of border barrier has been erected this year, and another 97 miles will be completed by the end of the year, Lt. Gen. Todd Semonite, the chief of engineers and commanding general of the U.S. Army Corps of Engineers said. He estimated that another 277 miles will be completed next year, for a total of 450 miles by December 2020. Trump also heard from Sheriff Dave Robinson of Kings County, California, who was representing Immigration and Customs Enforcement (ICE) at the roundtable. Due to the lack of space in detention facilities, 126,000 illegal aliens were released into the United States since the end of last year, he said.